Joel Kinnaman has tried to find a suitable franchise in America and came close with the RoboCop remake, which didn't really resonated with fans. He's been in Suicide Squad, and countless other action dramas that almost got there, but not quite. Now, Kinnaman is back in his most ambitious crime thriller yet. Today, we have a first look at The Informer with the trailer debut from Aviron Pictures. Caught in a world of impossible choices, watch as one man plans to escape the clutches of three of New York City's most powerful organizations, the mob, the NYPD and the FBI, in order to save himself and his family. Starring alongside Joel Kinnaman are Rosamund Pike, Clive Owen, Common, and Ana de Armas. Aviron Pictures' The Informer is in theaters nationwide on March 22nd! 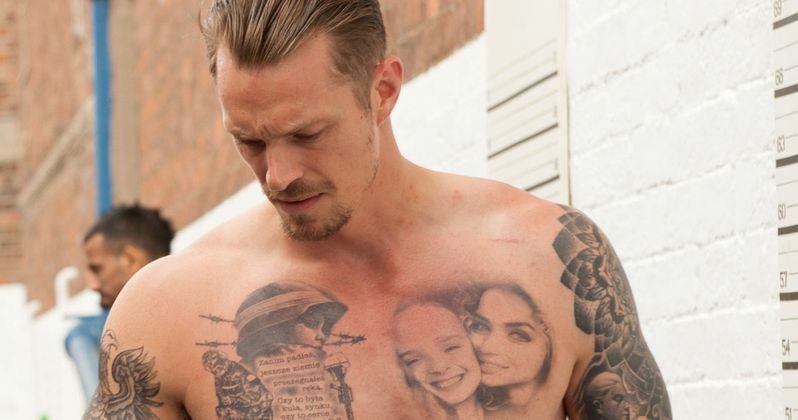 Honorably discharged Special Ops soldier Pete Koslow's (Joel Kinnaman) world is turned upside-down when he is jailed after a fight to protect his wife (Ana de Armas). He's given a chance for early release by becoming an informant for the FBI (Academy Award nominees Rosamund Pike and Clive Owen) and using his covert skills in an operation to take down The General, the most powerful crime boss in New York. Koslow must return to prison, where he formulates a plan to escape the clutches of his oppressors. Andrea Di Stefano directs The Informer. He is working from a script by writers Matt Cook, Rowan Joffe and Andrea di Stefano. The movie is based upon the book "Three Seconds" by Anders Roslund and Börge Hellström. This crime thriller is produced by Basil Iwanyk, Erica Lee, Wayne Marc Godfrey, Robert Jones, Mark Lane, James Harris, Ollie Madden for Aviron Pictures. You can check out Joel Kinnaman as he attempts to once again break through in a big way with his own starring vehicle. The man is jacked and ready to get down and dirty. He's set to return in Suicide Squad 2, but that sequel is being revamped by disgraced former Disney director James Gunn, who could bring in a whole new cast. Joel Kinnaman was also signed for more RoboCop movies, but that first one is considered a flop, so that franchise is being retooled as a follow-up to the original which won't include Joel. So now, we'll have to settle for The Informer, which appears to be better suited to the man's talents. This definitely looks like one of next year's can't miss action outings.